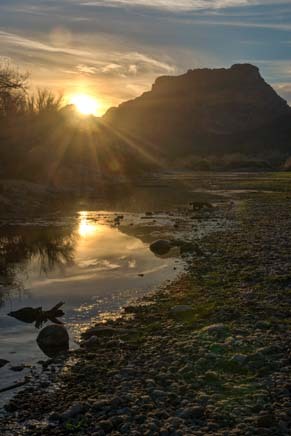 Rivers of Phoenix – Oases in the Desert! 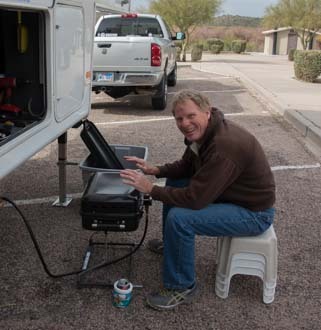 February, 2014 – We had been living among the saguaro cactus on the outer fringes of Phoenix Arizona for a few weeks, loving life in the sweet Sonoran desert. 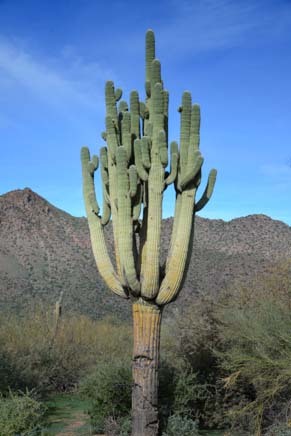 The weather continued to be stunningly warm, with temps in the high 70’s every afternoon, and we hiked and biked all over the place, soaking in the beautiful views of the aged and stately cactus whose personal histories reached back before Arizona achieved statehood in 1912. Heck, these guys were saplings in the 1800’s! 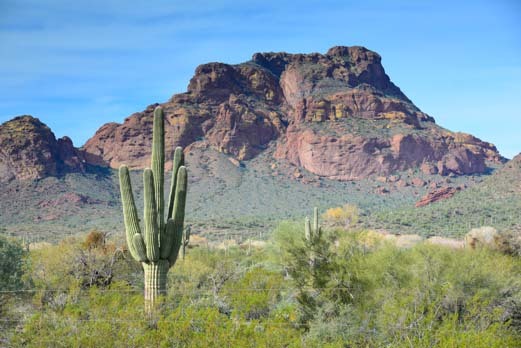 While visiting friends in nearby Fountain Hills, we took a bike ride through the Fort McDowell Indian reservation. Poking around the back roads, we took a turn down a lane and suddenly found ourselves standing next to a flowing river. 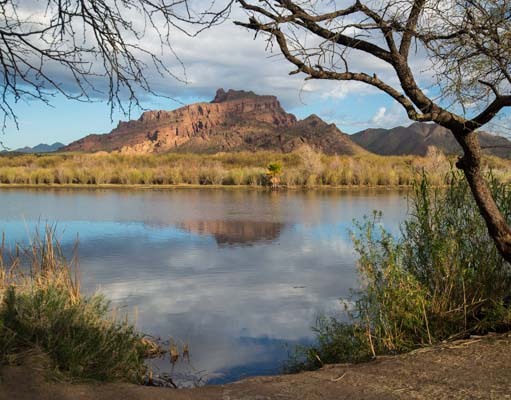 It’s funny, even though we’ve called Phoenix “home” for a long time, it hadn’t really sunk in for me that there are rivers here that flow year round. You just don’t notice them as you drive around town. 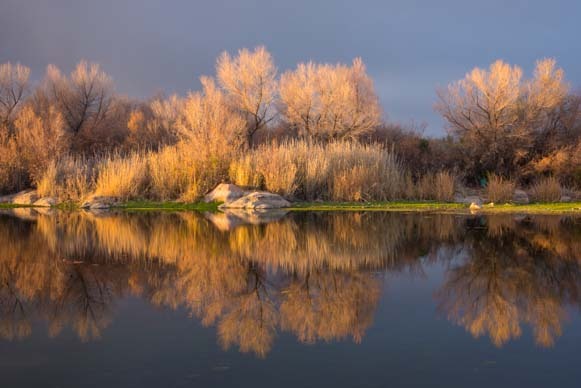 These are vibrant riparian habitats where long legged birds go fishing, animals of all kinds come down for a drink of water, and tall reeds grow by the water’s edge. 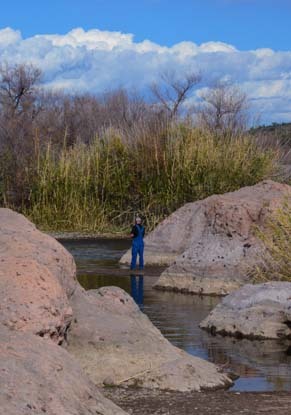 Several rivers flow through Phoenix, and we spent a few weeks exploring the shores of two of them, the Verde River and the Salt River. 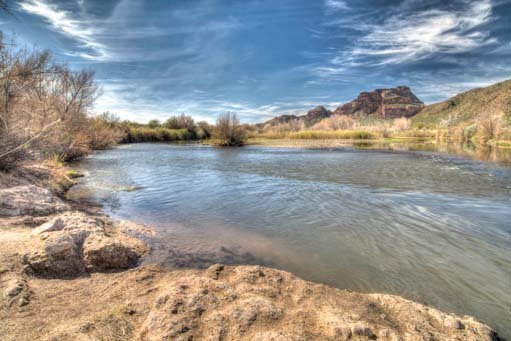 In the Phoenix area the Salt River runs east-west and the Verde runs north-south. 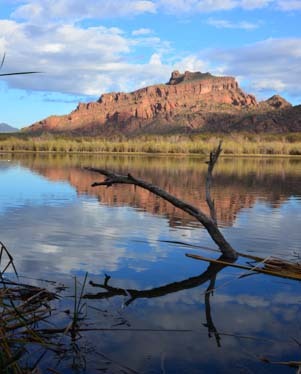 They converge in a corner of the Tonto National Forest tucked between Fountain Hills and Mesa. This confluence is a very special spot where kayakers paddle up and downstream, fishermen stand patiently by the water’s edge waiting for a catch, and people of all ages picnic and hike along the craggy shoreline. 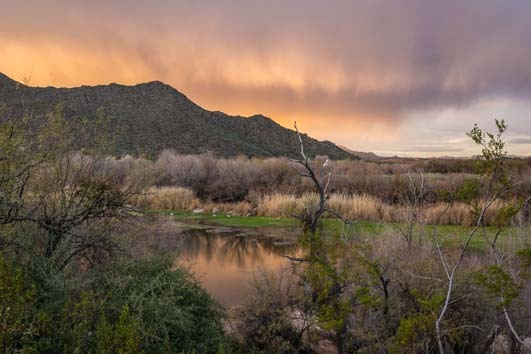 After being immersed in the Sonoran desert for a few weeks — a landscape rich with flora and fauna that can thrive on just an occasional spritz of dampness — we loved watching the leaves and algae and twigs floating lazily downstream on this steadily flowing body of water. 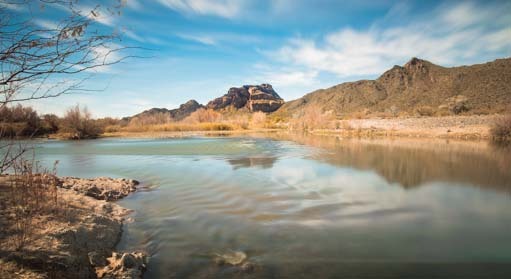 Whether stalking that next beautiful photograph with camera and tripod, or riding our bikes on a road that paralleled the flowing water, or hiking along the rocky banks at the river’s edge, we were floored by the change of scenery from the classic Sonoran desert to this watery world, a transformation that takes place in just a few steps. In the late afternoons the shoreside trees and reeds come alive with the raucous clamor of birds singing and calling each other and deciding who is going to roost where (and with whom!). 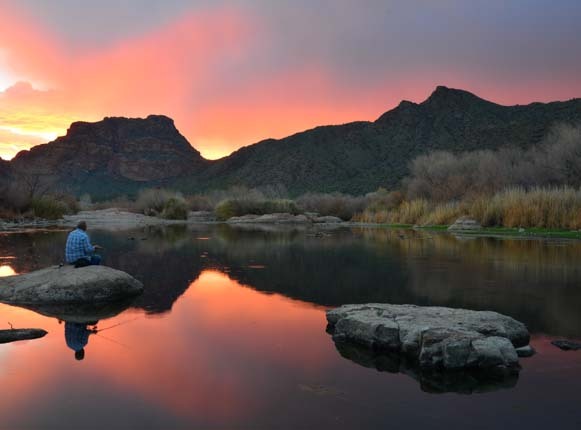 The Salt River doesn’t flow fast, but it is steady. “It sounds like I’m in the Amazon,” Mark said to me one afternoon. We had staked out a spot to catch the late afternoon light, and the shrubs were alive with exotic squeeks and squawks. There is easy access to the south side of the river, but the north side doesn’t have any roads or trails, so I was surprised when I suddenly heard the loud crunching noises of branches breaking from across the water on the north side of the river. It sounded like the deliberate movements of something very large that was cracking tree limbs. I stared into the reeds wondering who the heck was over there. I couldn’t imagine there could be a person weed-whacking their way through the dense vegetation. It had to be an animal. 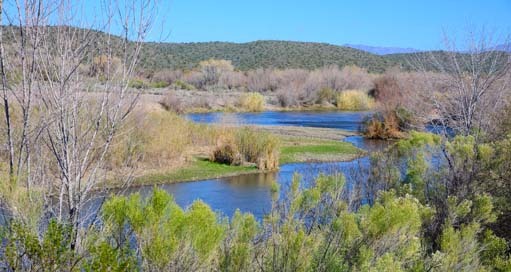 We had heard reports that wild horses had been spotted down by the river, and I studied the shore across the way, hoping for a glimpse of a wild horse. 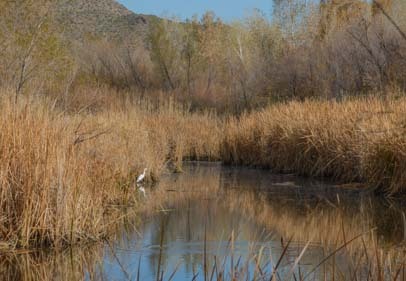 After a few minutes, the tall reeds parted and a big brown cow emerged and slowly made its way down to the water. Well, it wasn’t as cool as a wild horse, but it was still pretty darn cool considering the concrete jungle of freeways and humanity that were the essence of greater Phoenix all around us just a few miles away. 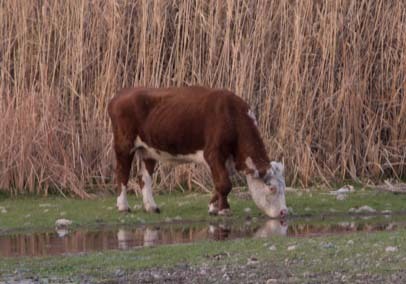 The cow took a long drink, stared at me for a while, and then dipped its head for another sip before slowly vanishing into the reeds once again. This incredibly beautiful and peaceful spot can’t keep the insanity of the city at bay all the time, though, and one day while we were out on a bike ride we saw the bizarre sight of a car flipped upside down on one of the small national forest roads. We found out a young fellow had come blasting down the tiny, twisty roads of the area at breakneck speeds. 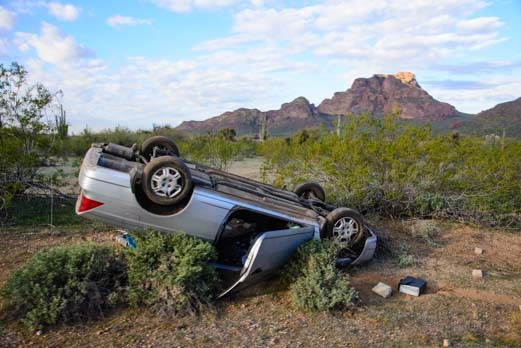 Luckily, he escaped breaking his neck when he lost control of his car. 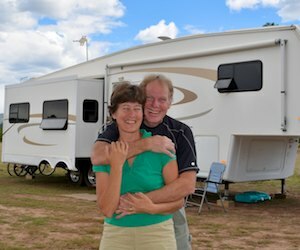 and they put it on their blog banner at www.flyingthekoop.com! He was seen walking off into the desert, although police later found a loaded gun in his car. Trouble in paradise, I guess! For us, however, life was full of contentment, and we enjoyed a steady stream of quiet, happy days. Mark got the barbecue going in the evenings, something we had not done in our boating lives and that we had missed sorely, and we met up with new friends of ours, Mike and Donna, whom we had met in San Diego. The late afternoons and evenings continued to lure us down to the water’s edge every day, and we were treated to some glorious sunsets. There is a “golden hour” just before the sun leaves the sky when everything seems to be lit from within with a truly golden glow. We caught this heavenly light one afternoon when the water was totally still. This created a perfect mirror for everything on shore. Rain was falling in the distance, and the clouds were streaked and heavy with moisture, creating a mystical air in the twilight. The light turned from a crisp, radiant yellow to a burnt orange and finally to a soft pink blush that lit the river’s edge in a luminous warmth. There was a peace here that soothed our souls. We didn’t realize what an unusual sunset this was until we after we had tried to recapture it every night for a week. Every afternoon, as the sun began its final descent, we ran down to the water’s edge, tripods in hand, hoping for a repeat of that ethereal light. However, the special light we saw that night, that warm glow that faded from gold to a pink blush to a lavender mist was never quite the same again. Many sunsets were spectacular, but that fleeting moment where the whole river seemed to hold its breath as everything shimmered in a rose colored halo had been utterly unique and never happened again. So it is with nature, and we are learning to savor every day that comes. 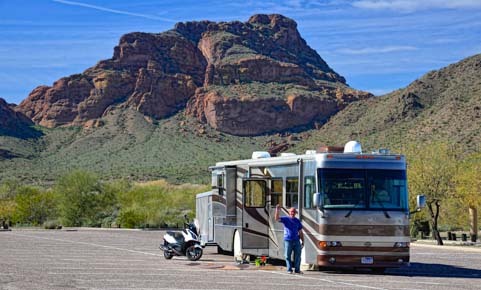 This entry was posted in Arizona and tagged Arizona, Arizona Central, Arizona Phoenix East, Desert and Water, New, Travel, USA, WP Travel by Roads Less Traveled. Bookmark the permalink.